You want to add your site to Google Search Console. But before Google will start letting you control your site, view your analytics, or submit your sitemap, it’s asking you to verify your site, right? Essentially, Google site verification is about proving that you actually own the site you’re trying to add. Google doesn’t want to give those powers above to just anyone, so Google requires webmasters to complete the Google Search Console verification process before they can manage their sites. Thankfully, this process is pretty simple, and there are a variety of ways in which you can verify your website with Google Search Console. You can click above to jump straight to one of the sections. Otherwise, we’ll get started with the manual methods. If you’d prefer to use a WordPress plugin to verify your site with Google, click here to jump to that section. With this method, you just need to upload an HTML file to the root directory of your website. It’s simple, but the downside is that you will need access to your server to upload the file, either via FTP or something like cPanel File Manager. Next, you’ll need to connect to your website via SFTP. Here are instructions for how to use SFTP at Kinsta. Once you’ve successfully connected, upload the file that you downloaded from Google to the root folder of your site (this is the folder that contains the wp-content folder, wp-config.php, etc.) At Kinsta, this folder is named public. 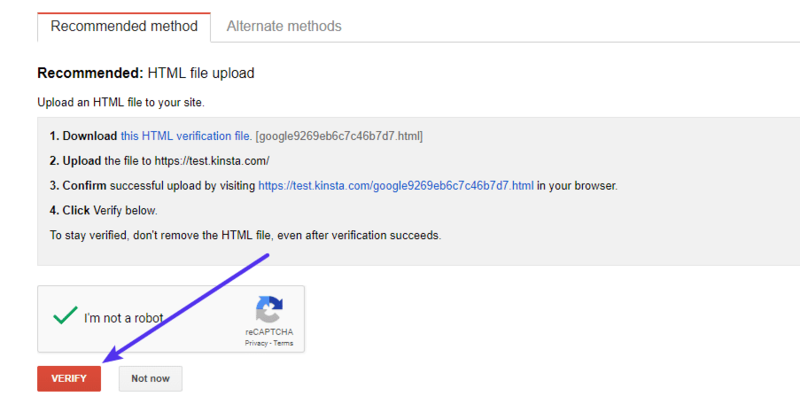 You can also use this method to verify the Kinsta CDN with Google Search Console. We’ll show you how to do it using the plugin method – but it’s also fine to add it directly to your theme as long as you’re using a child theme (if you don’t use a child theme, you’ll lose your Google site verification every time you update your theme). There are also some alternative ways in our in-depth post on how to add code to your WordPress header and footer. With this method, you’ll add a TXT record at your DNS provider instead of needing to add any code to your site. Because there’s no code involved, this is the best method from a pure performance perspective. Sure – the other Google site verification methods only add a few lines of code – but every bit counts when it comes to performance, right? So if you’re a performance optimization fanatic, this is the method that you should use. Learn more about DNS site verification. To get the DNS TXT record that you need, go to the Alternate methods tab in Google Search Console and select Domain name provider. Next, you need to add that TXT record at your domain registrar or DNS provider. You should be able to find specific instructions from your provider. If you’re using Kinsta DNS, you can add this TXT record directly from your Kinsta dashboard. If you already have the Google Analytics asynchronous tracking code installed at your site, you can easily verify your site using Google Analytics. Just like Google Analytics, if you’re already using Google Tag Manager, you can verify your site with just a single click as long as you have the Google Tag Manager container snippet active on your site. Don’t like the manual methods above? If you’re using a WordPress SEO plugin, there’s a good chance that your plugin of choice offers an easy tool to help with Google site verification. We’ll show you how to do it with the two most popular plugins – Yoast SEO and All in One SEO Pack. To complete the Google Search Console verification process with Yoast SEO, go to SEO ? General in your WordPress dashboard and select the Webmaster Tools tab. You can copy the entire tag, the Yoast SEO plugin will automatically strip out the extra, leaving just the code. Make sure to click Save changes in the Yoast SEO interface when you’re done. To verify your site in Google Search Console with All in One SEO Pack, go to All in One SEO ? General Settings in your WordPress dashboard. You can copy the entire tag, the All in One SEO Pack plugin will automatically strip out the extra, leaving just the code. Make sure to click Update Options in the All in One SEO Pack interface when you’re finished. For the absolute best approach for performance, we recommend using the DNS TXT record method because it doesn’t require you to add any code to your site. Beyond that, there’s not any functional difference between the other methods, so you should pick the method that feels easiest to you. Just remember – Google will periodically check on your site’s verification. So no matter which method you choose, it’s important to leave that method in place – you cannot remove it after verification. Do you have any other questions about the Google Search Console verification process? Leave a comment and we’ll try to help!